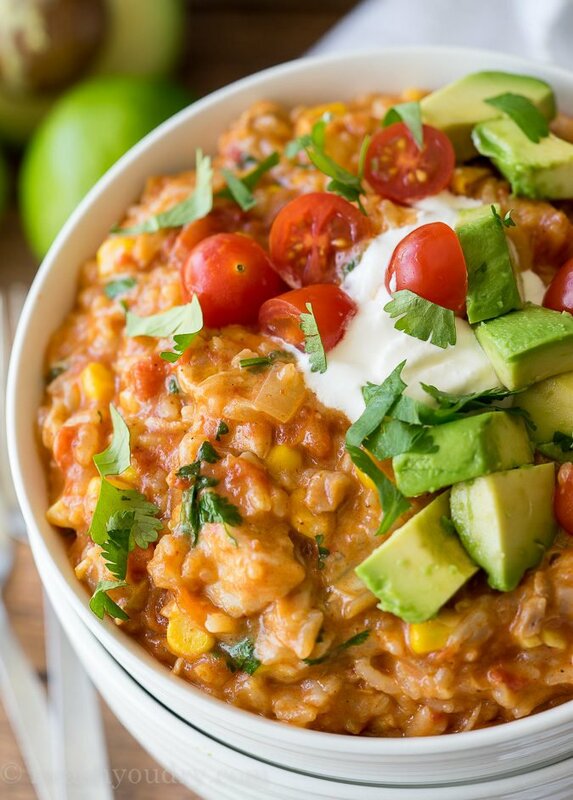 Instant Pot Mexican Chicken Rice is a super quick and easy dinner that’s thrown together in minutes! 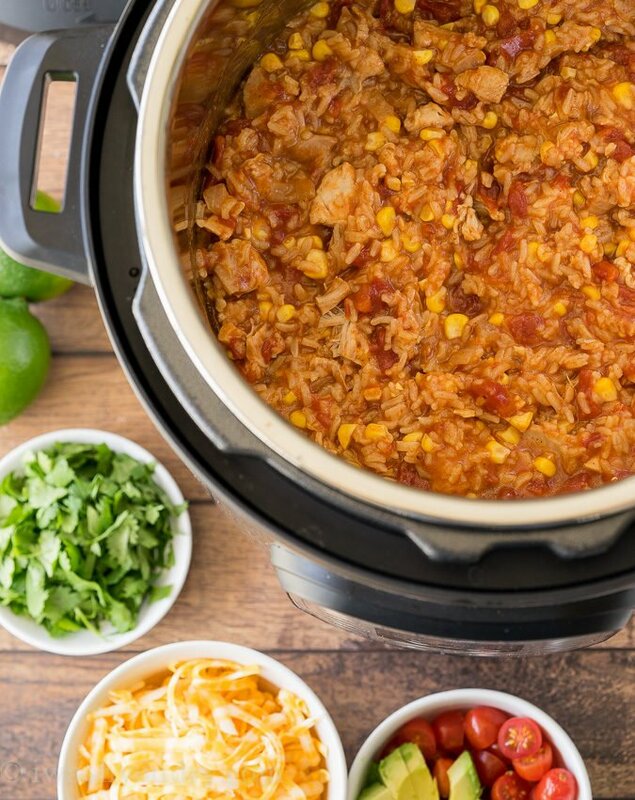 Instant Pot Mexican Chicken Rice is the very first pressure cooker recipe I’m sharing on my site, and boy is this a good one. 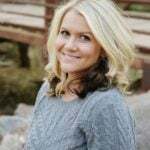 I drank the Instant Pot kool-aid and I’m absolutely hooked! Do you have a pressure cooker? If not, get one! It’s seriously life changing! I bought the Instant Pot last month for my birthday and since then, I’ve been playing around with it and getting used to the way it cooks. One of my favorite things about a pressure cooker is how you can just throw everything in, push a couple buttons and in minutes you can have super tender meat and flavorful dishes. 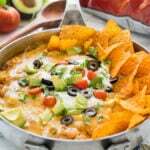 This recipe is a twist off of one of my One Skillet Recipes, Mexican Chicken Taco Skillet. 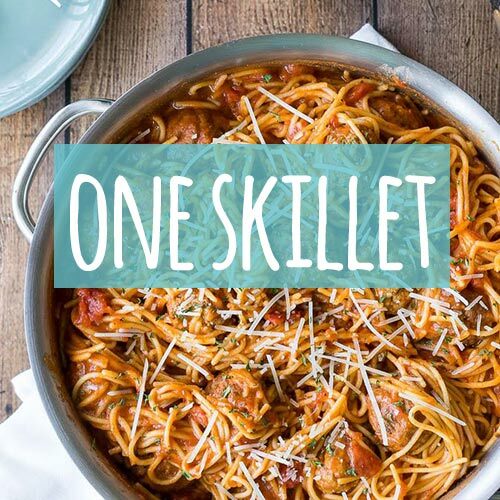 If you thought a one skillet recipe was easy, well this IP recipe is even easier!! 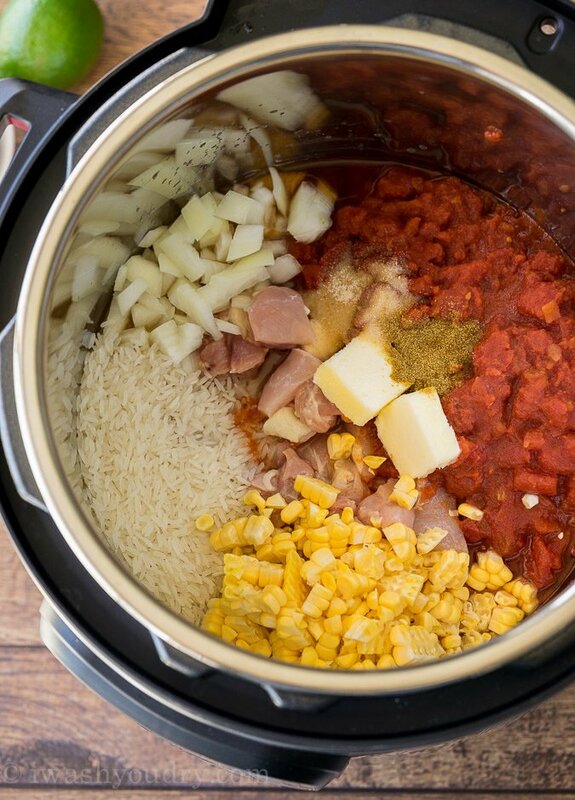 Simply throw all the ingredients into the pressure cooker, give it a stir and pop the lid back on. Push the Poultry button and adjust the timer to 12 minutes. Go grab a magazine and get some quality ME TIME before dinner is ready! Yes, it’s seriously THAT EASY! The 12 minute timer will start to count down. Total time from actual start to finish – you’re looking at close to 45 minutes, but keep in mind, this is totally hands free cooking! So, is the Instant Pot totally worth it? YES! I’ve fallen in love with the ease of just tossing in all the ingredients and having super tender chicken, shredded pork, and fluffy rice. Beans are next on my list of things to make, so I’ll keep you posted on that! I have even used the IP as a slow cooker with equal success, so it’s a great all around tool to have in your kitchen. 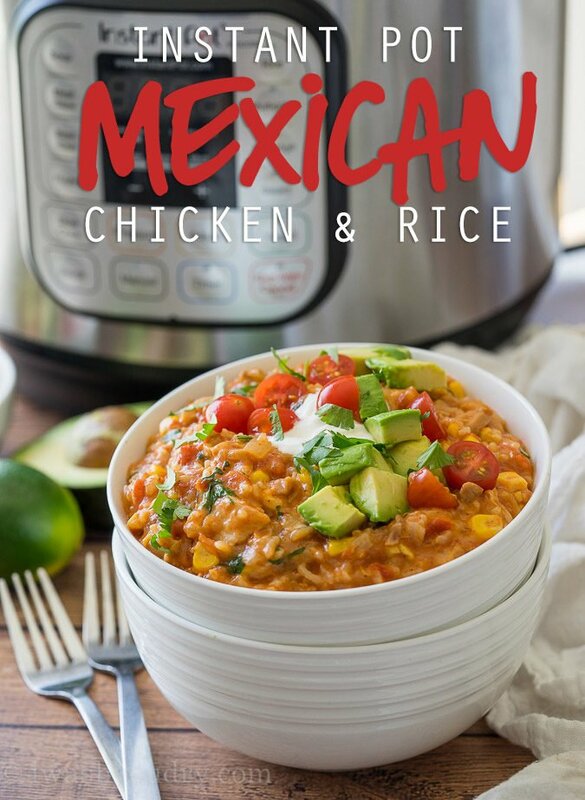 If you’re looking for your first (or next) Instant Pot recipe to try, give this Instant Pot Mexican Chicken Rice a try! You’re going to love it! 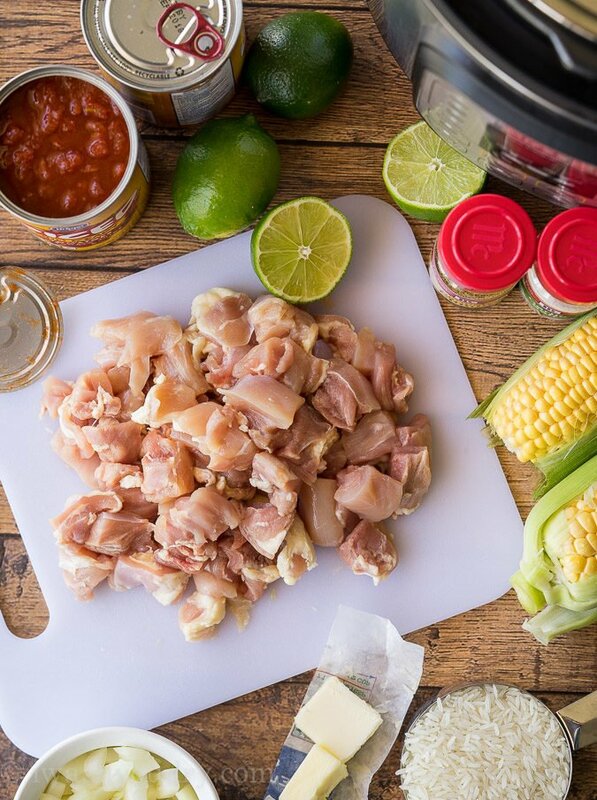 Combine the chicken, diced tomatoes, onion, corn, rice, lime juice, garlic salt, cumin, butter and water in the pot of your pressure cooker and stir to combine. Set to the POULTRY setting for 12 minutes with the steam release valve in the closed position. Let the pressure cooker naturally release pressure (about 10 to 15 minutes). Stir the mixture to fluff the rice. Add in the 1 cup cheese and 1/3 cup chopped cilantro and stir until cheese is melted. Serve in bowls, with optional taco toppings if desired. Enjoy! *Updated recipe 12/28/17 to increase liquid amounts to 1 cup of water. This is delicious! Will make again! I love this recipe. I do not mix everything together. I basically layer it with the corn, onion, and chicken on the bottom, put the rice over that, sprinkle the seasoning on top of the rice, throw the butter in, then pour the tomatoes and water over everything and start the IP. Putting the seasoning and liquid ingredients on top ensures that everything on the bottom gets the flavor and keeping the rice off the bottom prevents the Burn notice. I like to chop the chicken into bite size pieces when I buy it and then freeze it so I can dump it frozen in the pot without defrosting. I would like to clarify, is it 1 cup of water or 2 cups of water for this recipe? It is one cup of water. 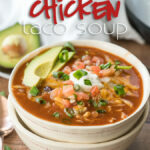 This recipe is by far my favorite instant pot recipe!!!! I use taco seasoning instead of all the spices. I have made it 5 times and never had any burn notice. Only thing is I have to figure out how to not have mushy rice. But it is fantastic!!! 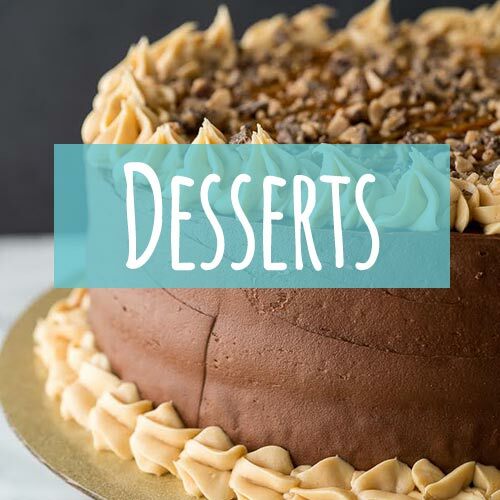 So glad you are enjoying the recipe Jodi! I have a 6qt and got the burn notice as well. Also the rice was mush. Sorry won’t be doing this one again. I’m sorry you didn’t get better results with the recipe Cheryl. I’m thinking with a 6 qt. pot more water would be needed. It cooks great in my 8 qt. SUCCESS!! I didn’t read the comments about burning until it was already going, and I was terrified about what it was going to look like when I opened it up. But when it was done, it was great! Here’s what I did that maybe helped. I used 2 cans of petite diced tomatoes, undrained, 1 cup of frozen corn, and I only had partially frozen chicken breasts (don’t ask). I put everything in, tomatoes first, and didn’t even stir it (I was in a rush to get it on the table). I have a 6 quart pot. No “poultry” setting, so I used “meat/stew”. 12 minutes per the recipe. No burning!! I thought the texture of the chicken would terrible, but it turned out ok. The rice is mushy but I perked up the texture with some leftover black beans, I had cooked in the pot the other night, and tortilla chips. I feel the flavor was a little bland with the tomatoes I used, so I’ll try different ones next time. Burn notice for me as well. I wish I had read the comments too. Scorched the bottom of the pan. I have no idea how it turned out edible. Burn message for me too (8 qt and I’ve cooked rice in our IP once before with no issues – though we don’t have a ton of experience with it yet). I am wondering where you live altitude might have an affect on boiling point too. I’ve just poured it out in my dutch oven and cooking on the stove top. I figure 20-30 minutes is probably enough. I’ll try putting the rice on top next time after mixing. Disaster for me too! Burn message several times. The rice is mush. Maybe I should finish cooking it on top of my stove. Ugh! What a disaster…I unfortunately didn’t read the comments prior and all the food was ruined. I love all the recipes and I’m excited to try them but I’m nervous now that my pot is so burned. Maybe put a disclaimer with it for us new people. This was my first insta pot try and I’m super frustrated now. I’m sorry you had trouble with this recipe and getting the burn notice. I’ve cooked this several times and haven’t had that happen to me. All you need to do to clean burned stuff off the instant pot is let it soak with some warm water and soap and it’ll come right off. As for the recipe, I’m wondering what size pot you have? I use an 8 quart and thinking maybe since there is more surface area that is why I don’t get a burn notice? I have an 8 quart and still got the burn notice 🙁 Dinner is ruined. This is the only recipe that didn’t turn out in my Instant Pot. I don’t have an instapot, I have a Cuisinart. So did we get a final total in the amount of water to add? Is this a regular measuring cup of rice, and water vs the cup that comes with rice cookers? Is the total time high for 12 minutes? I know it will need time to pressurize, but I just need the time as my type if PC doesn’t have speed buttons. Would the pressure cook setting be the same as the manual setting? Instead of chili/tomatos I used salsa and added extra water. My rice was mushy but I didn’t have a burn notice and it tasted delicious. 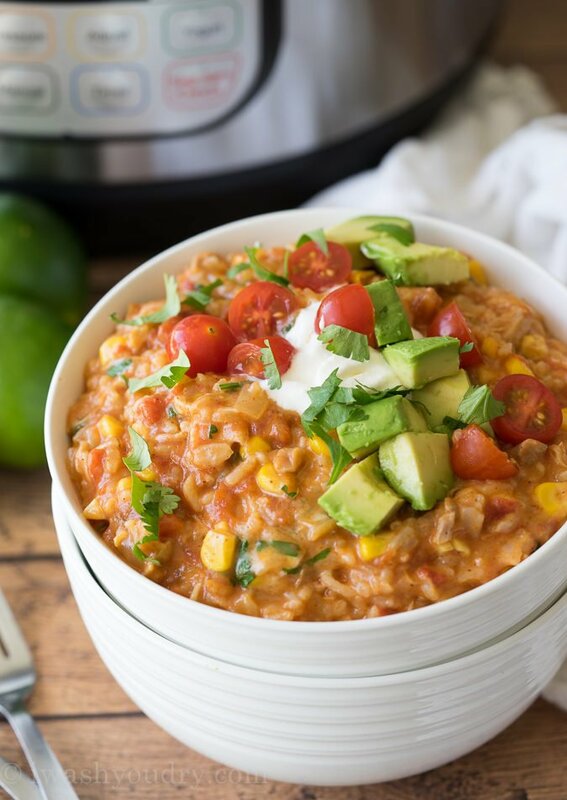 This was the first instant pot recipe that I tried and my kids and I liked it alot. Thank you! Yeah so I did NOT get a “burn” error. I cooked everything as specified except that I added an extra half cup of water because it just didn’t seem like enough liquid. It came to pressure, cooked, and I did a NPR. Then I dumped it into a bowl. The whole bottom of my pot and about 1″ of food from the bottom was scorched. The whole meal went into the trash. Sigh. This is my first fail making an IP meal, but it’s also the first time I didn’t read reviews and comments. I got too confident (cocky?). 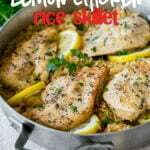 REALLY wanted to like this recipe! Hi Cyndi, oh man, I’m so sorry that you didn’t get awesome results out of this recipe. I’ve never had an issue with this recipe and burning or scorching on the bottom. Could it be that your pressure cooker took longer to come to pressure than normal? Maybe your seal wasn’t on properly? Black beans in the instant pot are astounding. Like 25 minutes and natural release, 4 to 1 dry to water ratio. No other steps needed. 4 water 1 dry, by volume, sorry I realize now that was inverted and unclear. First of all I love this recipe. That was probably one reason why I didnt give up on it after first time it burned. No matter how much water I put it was a disaster. Yesterday I made just little tweaks, I put all the ingredients in the instant pot (except rice), mixed it completely and then put a cup of rice on top and half a cup of water on top of the rice. I didn’t stir it, just switched it on. It pressurized like a dream and cooked it perfectly without any burns on the bottom of the pot. I will give this a try! Thank you! I am new to this instapot thing and I live in Germany. 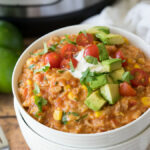 DUMB beginner questions…do you drain the corn and tomatoes? Also..my instapot has European settings….so any suggestions?? Thank you!! I also got the ‘burn’ notice on the IP Ultra. Burnt the heck out of my pot and we will be ordering takeout. It might have to do with the model pot used (at least that is what I read). Hi Shawn, Your recipe for Mexican Chicken Rice says to place the on “Poultry” setting. I don’t have that on my Instant Pot. Would the “Meat/Stew” setting be the same? You could just use the manual setting on High for this recipe. I’m so sorry you got a burn notice on this recipe. You can always coat the IP with non stick spray, but once you get a burn notice you have to completely remove everything from the pot, scrub it clean and start over. I don’t get a burn notice when I make this recipe, so I’m not sure why some do and some don’t. I tried making this for dinner tonight. I kept getting the burn message. After 1 1/2 hours of trying to get it to cook I finally transferred it to the crock pot and it will cook for the next 4 hours. Tonight’s dinner is fast food but if all goes well we will eat this tomorrow. The tricky thing with the burn signal is that once you get it once, you’ll have to remove everything from the pot and scrub the bottom clean. Then start over and add a little more liquid. Did you make sure to add the cup of water to the recipe? I made this for lunch today – so tasty! I don’t know what chili tomatoes are, so I just used petite cut. I threw in a little taco seasoning too (largely because I realized I have no cilantro and was afraid it would be a tad bland without). Liquid level was fine, if anything a bit too much. Next time I’m going to try adding some black beans to give it a little more color and texture. Tomorrow the cold leftovers are going on top of lettuce for a taco salad!